Several recent studies in immunology have used multiphoton laser-scanning microscopy to visualise the induction of an immune response in real time in vivo. These experiments are illuminating the cellular and molecular interactions involved in the induction, maintenance and regulation of immune responses. Similar approaches are being applied in cardiovascular research where there is an increasing body of evidence to support a significant role for the adaptive immune system in vascular disease. As such, we have begun to dissect the role of T lymphocytes in atherosclerosis in real time in vivo. 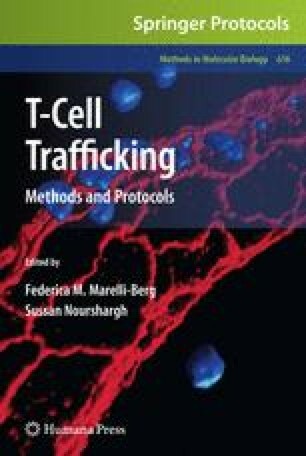 Here, we provide step-by-step guides to the various stages involved in visualising the migration of T cells within a lymph node and their infiltration into inflamed tissues such as atherosclerotic arteries. These methods provide an insight into the mechanisms involved in the activation and function of immune cells in vivo.